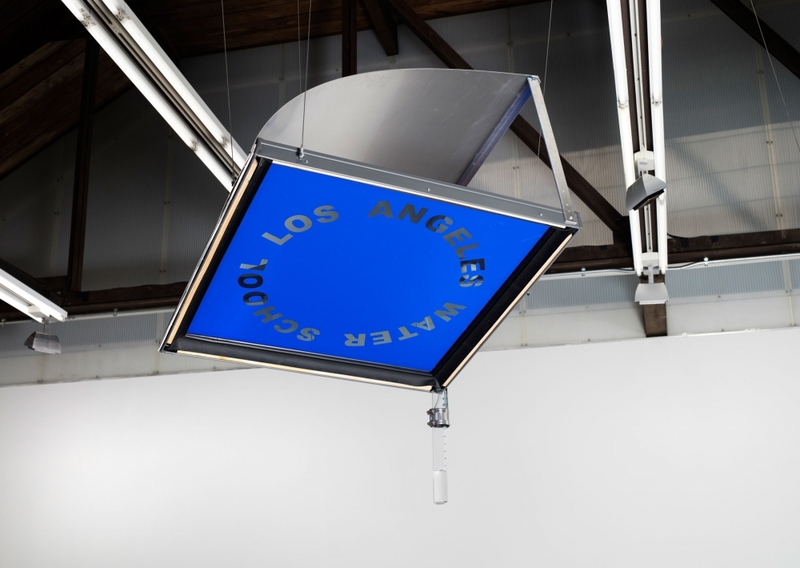 Oscar Tuazon, Rainbender (LAWS), 2018, Velux skylight, aluminum, steel, borosilicate glass, vinyl, Sharpie, enamle, water. Oscar Tuazon investigates the relationship between art, architecture, and issues related to water and land rights in his exhibition. As part of a longer-term project, Tuazon will initiate a new version of his “water schools” at Michigan State University, which will speak to the local context while also connecting the conversation in Michigan with the artist’s schools in California and Minnesota. Central to the exhibition will be an effort to prototype a new passive solar architectural system—a “water window”—based on the pioneering work of the inventor and architect Steve Baer. Over the course of the presentation, various local and regional communities, as well as MSU-affiliated individuals and groups, will be engaged through a robust schedule of meetings, tours, and designed conversations, all geared toward raising awareness around these critical issues. Oscar Tuazon: Water School is curated by Steven L. Bridges, Associate Curator, and Marc-Olivier Wahler, Director. Support for this exhibition is provided by the Graham Foundation for Advanced Studies in the Fine Arts and the Eli and Edythe Broad endowed exhibitions fund. For more information, please visit MSU Broad's website.